Home Blog What Makes Up My Garage Door System? It's not really possible to rank the different components of your garage door system according to importance. For example, We might consider the springs essential, which they are, but who can deny the significance of other small parts like the brackets and hinges which are also needed for your system to work? In the end, all the various components are important if we want the overhead door to continue to function optimally. Read on for a run-down of the different components which make up your garage door and the important role they fulfill! Garage door openers enable the automatic operation of your door. Without this unit, we'd have to manually open and close the door - hardly convenient if you need to get out of the car in the pouring rain or snow. Essentially, they're designed to make our lives easier - lately, they've developed more and more into high tech gadgets complete with rolling code technology and long distance remote control access through smartphones. It's an exciting space to watch over the next few years in terms of innovation. The door won't open without functioning garage door springs. It's no wonder why your springs are the kings of your system's kingdom. Thanks to the special movement of their coils, they make the full raising and lowering of your door possible. As part of your complex spring system, your garage door cables are also extremely significant components. When the springs move, they transfer their movement to the cables, which also move in order to guide the door higher or lower. It is basically a combination of the spring and cable movements which make the movement of your door possible. 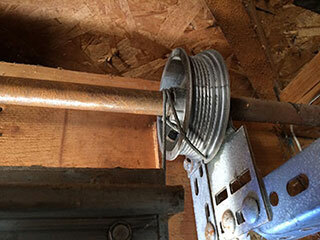 The actual movement of your overhead door is also possible thanks to the garage door rollers. They are connected with hinges and brackets and as they move up and down the tracks, they hold the door in place as it glides up and down. The tracks are vital, too. They provide the highway along which your door moves. Without correctly aligned tracks in good condition, the rollers wouldn't be able to roll the door along as it lifts and lowers. As you can see, all these parts are extremely important which is why the maintenance of all these parts is equally significant. Broken springs and dented tracks won't serve anyone. Further, the obvious need for the larger components like the springs and opener doesn't diminish the significance of the brackets, fasteners, and hinges which help to keep the whole thing together and secure. For further information or to book an maintenance or garage door repair appointment, get in touch with our team today in Monticello, Minnesota.